The University of Dubuque Cheer and Stunt team is at the forefront of Spartan athletics, providing the game day spirit not only at athletic events, but at events throughout the campus community. The Cheer and Stunt team is under the care of the University of Dubuque Athletics Department. The student-athletes who make up the squad attend camps in the summer, travel to post-season games as well as men's and women's basketball tournaments, and compete in national competitions. 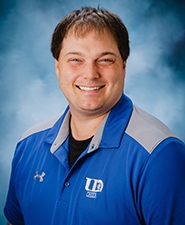 The University of Dubuque team is comprised of a co-ed core of performers who lead the crowd at football, men's basketball, women's basketball, and other events. Members of the cheerleading squad follow the NCAA-mandated AACCA guidelines while at games, events, and practice. The Iowa Intercollegiate Athletic Conference (IIAC) held its inaugural Competitive Cheer and Dance Invitational Sunday, February 11, 2018 at Buena Vista University. The University of Dubuque claimed the Cheer Routine-Stunt title for the Spartans. In the Cheer Routine-Stunt category, UD scored 54.83 points in winning the title, while Simpson was second with a score of 53.5. The Dance and Cheer teams from the American Rivers Conference endured snowy travel to arrive at the P.H. Kuyper Gymnasium for the second annual A-R-C Competitive Dance and Cheer Invitational. If you're interested in cheer and stunt at the University of Dubuque, complete the prospect form, and a coach will be in touch. Ashley Bausman Junior Freeport, Ill.
Aimee Bowser Freshman Cuba City, Wis.
Chamayze Hall Sophomore Rockford, Ill.
Annalise Hauk Sophomore Lancaster, Wis.
Jaecee Kober Freshman Racine, Wis.
Destinee Longtin Freshman Ingleside, Ill.
Sierra Hartmann Freshman Lindenhurst, Ill.
Sydney Martin Freshman Milan, Ill.
Alexandra Packard Junior South Haven, Minn.
Emily-Jo Pierce Senior Fairfax, Va.
Adore Sims Freshman Lynwood, Ill.
Brianna Thompson Freshman Lyons, Ill.
Drew Ritchie re-started the cheer and stunt program at UD in 2011. He coached at UD from 2011-2016 before taking a position with the University of South Dakota Cheerleading. Ritchie returned to UD in January of 2018. He has over 15 years of cheerleading coaching experience at the college, high school and all-star levels. He also has five years of experience working with NCA as a camp instructor and as a head instructor. He resides in Dubuque, Iowa and holds a bachelor’s degree in Criminal Justice.